Silicon Arabic is a new art project of Muhammad Aurangzeb Ahmad. In case you don't know him, he also runs the fantastic website, Islam and Science Fiction and is the editor of Islam and China blog (and website). In his spare time, he also got a PhD in computer science and now works at a company in Minneapolis, building models of human behavior. 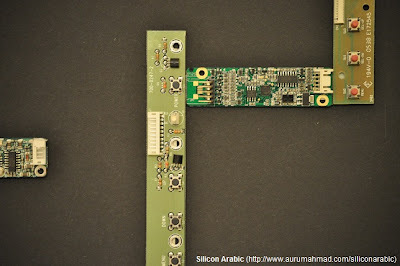 Silicon Arabic combines the aesthetics of the traditional and ancient Islamic Art of Calligraphy with a modern medium – Silicon circuit boards.I have been practicing Arabic Calligraphy for more than a decade now and Chinese calligraphy for the last three years and I have had the idea of Silicon Arabic for the last three years at least but it is only now that I have had the chance to execute this idea. I also work as a Scientist and so this was a perfect opportunity for me to combine two different area of my interest. The art of calligraphy has been an endemic part of Islamicate cultures for more than a thousand years. Although it was primarily developed by Muslims it is not limited to people of Muslim background with people of the Christian faith and other local religions practicing this art form. The idea of using circuit boards to create Arabic calligraphy is thus a new way to express this ancient art form. The word Kun (كن) in Arabic means Be and in this context it refers to the Islamic story of creation where God said Be and the universe came into existence (Fayakun). Thus the word Kun is tied to creativity. The compound (Kun Fayakun) is a constant motif in my work in general even in other forms of calligraphy. In the Sino-Islamic tradition the word Tianfan was used to refer to the religion of Islam which means heavenly square or celestial square. The term has a translocative meaning as it locates the religion of Islam in both semantic and geographical terms viz-a-viz the country of China. The term Tianfan directly refers to the Ka’aba (which means Square in the Arabic language). It is the square structure in Mecca to whose direction Muslims through out the world pray towards. 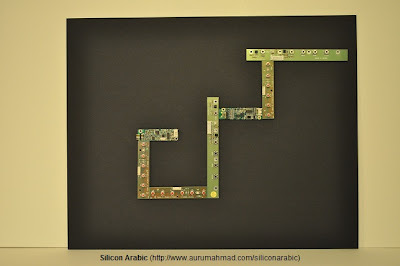 Here is my interpretation of the Ka’aba made with circuit boards. The centrality of the Ka’aba is grounded in this art piece where the mundane and the sacred meet in the digital, where the past, present and the future meet. 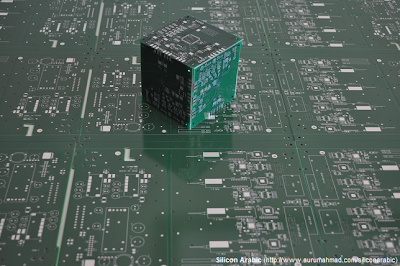 You can get to his Silicon Arabic website here. Thanks for the shout out. I hope that people like it and the idea catches on.